So, here I sit, with one Dalaran Cooking Award to my name and not a recipe to use it on (when I get 3). As we already knew, the Chef achievement is broken as it is impossible to complete The Northrend Gourmet. But I have done as much as possible right now and I look forward to the vendors having a couple new recipes for me in the near future. To be prepared for those recipes, I'll just have to visit a vendor to make my Kungaloosh and I'll have to do some fishing tonight to be ready for the Fish Feast. I'll also need to kill some worg and gather some meat for the upcoming Worg Tartare recipe. The Kungaloosh recipe will be available from a vendor if you have completed The Taste Test (which I have) and the Fish Feast and Worg Tartare will be available for Dalaran Cooking Awards. So in 5 or fewer days, I'll have the requisite Awards ready for purchasing the recipes and I will be able to hit exactly 45 recipes for the Northrend Gourmet (I sit at 42/46 right now). I'm also at 157/160 for the Chef de Cuisine, so these three recipes will also get me that achievement. And as I sit at 66/100 Dalaran Cooking Awards, it will take me approximately 24 or so days to achieve 100 Dalaran Cooking Awards to completely finish the Cooking Achievements. So that was a nice run. 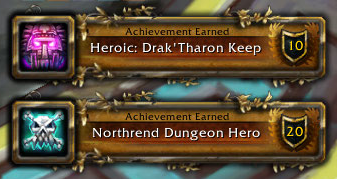 We continued on to the Halls of Stone so Phosphorex could get his Northrend Dungeon Hero (also obtained Northrend Dungeonmaster at the same time) and on the last boss we completed Abuse the Ooze, so we spammed guild chat with a LOT of achievements after that dungeon clear. The next day, as I realized last week how close I was to 1,000 daily quests, I put in the time both Saturday and Sunday to do 20+ quests and I was able to achieve my 4,500th point with 1,000 daily quests. So here I sit, with 4,500 achievement points. And tons to go. I started to work on some Arathi Basin achievements, but got frustrated and hardly made it through one game as the Horde were stomping us. It's just too hard to have fun in there unless you have a pre-made or get lucky and join a group who is semi-competent.